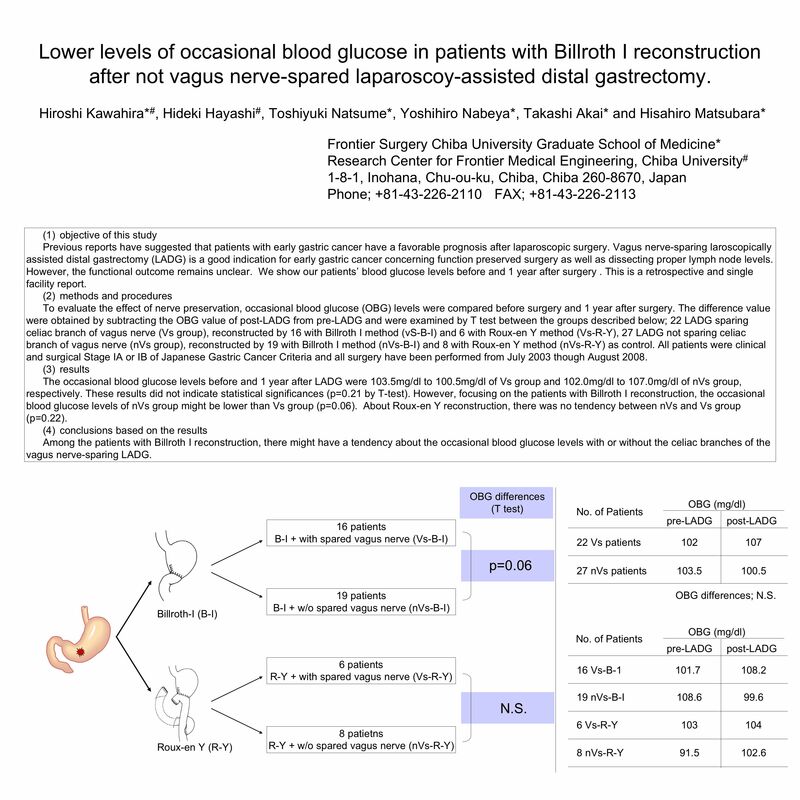 Lower Levels of Occasional Blood Glucose in Patients with Billroth I Reconstruction After Not Vagus Nerve-spared Laparoscoy-Assisted Distal Gastrectomy. Previous reports have suggested that patients with early gastric cancer have a favorable prognosis after laparoscopic surgery. Vagus nerve-sparing laroscopically assisted distal gastrectomy (LADG) is a good indication for early gastric cancer concerning function preserved surgery as well as dissecting proper lymph node levels. However, the functional outcome remains unclear. We show our patients’ blood glucose levels before and 1 year after surgery . This is a retrospective and single facility report. To evaluate the effect of nerve preservation, occasional blood glucose levels were compared before surgery and 1 year after surgery. We have performed 22 LADG sparing celiac branch of vagus nerve (Vs group), reconstructed by 16 with Billroth I method and 6 with Roux-en Y method. As controls, 27 LADG not sparing celiac branch of vagus nerve (nVs group), reconstructed by 19 with Billroth I method and 8 with Roux-en Y method. All patients were clinical and surgical Stage IA or IB of Japanese Gastric Cancer Criteria and all surgery have been performed from July 2003 though August 2008. The occasional blood glucose levels before and 1 year after LADG were 103.5mg/dl to 100.5mg/dl of Vs group and 102.0mg/dl to 107.0mg/dl of nVs group, respectively. These results did not indicate statistical significances (p=0.21 by T-test). However, focusing on the patients with Billroth I reconstruction, the occasional blood glucose levels of nVs group might be lower than Vs group (p=0.06). About Roux-en Y reconstruction, there was no tendency between nVs and Vs group (p=0.22). Among the patients with Billroth I reconstruction, there might have a tendency about the occasional blood glucose levels with or without the celiac branches of the vagus nerve-sparing LADG.